We also want to say we LOVE the effect of these products. My son's joint aches left.........immediately with the bracelet. "I NO LONGER GET HEADACHES FROM MY CELLPHONE OR CORDLESS PHONE, AND I SLEEP SO MUCH BETTER AT NIGHT"
"I LOVE YOUR PRODUCT. IT BLOWS Q-LINK AWAY!" "Single most effective thing I have ever done to increase my energy and health." I realized that I was running down the stairs, and I felt no pain. I mean absolutely no pain. I was shocked. Thank you for a fantastic product!!!!! Blessings to you, Jolee. Once I put my skepticism aside, I began wearing the pendant as prescribed. My headaches have been almost non-existent with its use. "FOR THE FIRST TIME IN YEARS I WAS ABLE TO WAKE UP RESTED"
With one off I was able to do sets of 3 pull ups. With it on I was able to do sets of 10 pull ups. "THE PAIN IN MY SHOULDERS AND ARMS HAS DISAPPEARED. I AM COMPLETELY SPEECHLESS"
"The pendant began shifting and adjusting my energy as soon as I put it on"
13 Year old dog gets new “leash” on life! Received my pendants and absolutely love them. I am getting zaps in brian though, like the ones you get one coming off antidepressants. "I also don't have Migraine Anymore." "THESE PENDANTS ARE SIMPLY A MUST-HAVE"
I'm truly stunned and amazed by the excellent quality of service that I've received from you both. "noticed immediate sinus relief and better breathing"
I no longer felt tired after a long day at work and I could watch movies on my laptop all day long with no uncomfortable feeling at all. FINALLY!! Something that works! I’ve been drinking it 9 days now and only have had 1 day that was a little rough. It's truly wonderful and gratifying to be a part of that healing process. Just wanted to let you know that my mother has been having fantastic results, with her arthritic fingers. I love this pendant! It's amazing and it works! Earth Energy and its many Benefits! The #1, MOST important thing to understand about the Scalar Pendant is that it puts us BACK in TOUCH with the earth! ALL biological life REQUIRES exposure to earth energy on a daily basis to maintain proper optimal health. Not only are MOST of us NOT receiving exposure to earth energy that we regularly need, but we’re COMPLETELY bombarded with man made energies and frequencies that can completely destabalize our health! It’s no coincidence that there has been a massive alarming shift in health problems with the technological revolution over the last 30 years. The replacement of natural environments full of negative ions and earth energy for man made environments full of EMFs and positive ions has had an extremely detrimental effect on our health that will only become truly apparent in the next 10-20 years. THANKFULLY Scalar Pendants Exist! With concentrated Icelandic Ash, they emit both negative ions and earth based energy frequencies which benefit the body on a continual 24/7 basis for life! They work primarily by balancing out all the negative man made energy and frequencies we cannot avoid every day of our lives! Will it run out of Energy? The simple answer to this question is a resounding NO! The pendant works by emitting a form of energy that will literally last hundreds of years. To put at a minimum we guarantee the energy will continue to emit for an entire lifetime. So short of losing your pendant or completely breaking it (the broken pieces will still emit energy) you will always receive benefits from your pendant equal to the day you first got it! These earth minerals innately emit energy and act almost like a super-charged battery, not relying on anything else to give them energy. At the rate they lose this energy it can take numerous life times for any tangible difference to occur. I’ve even tested pendants that I originally had from 2 years ago and they put out the same amount with no change! The pendant emits deep earth energy which comes in the form of negative ions as well as deep earth frequencies. The combined effect provides numerous benefits to the body or any biological life form for that matter! The ions help separate blood cells to allow for improved circulation. Where negative ions have an expanding effect, effectively allowing them better oxygenation, positive ions which we are commonly exposed to in indoor air environments create constriction. This leads to less oxygenation of red blood cells and fatigue is the end result. This however is just one aspect of the benefits the pendant provides. Negative ions are also integral to the flow of hormones in the brain. With improved negative ion levels in the body, an individual will experience improved levels of serotonin and dopamine due to the fact that the ions are allowing for better transport of hormones between receptors. The pendant also carries with it grounding earth based frequencies including the popular Schumann resonance. Will the Pendant Cause me to Detoxify? An individual can ALSO potentially experience a detox reaction, where-by the pendant is bringing in a high level of negative ions suddenly into the body. Most people will have an imbalance of too many positive ions. The initial balancing effect of negative ions neutralizing the positive ions leads to a detox which will specifically affect the liver most among detox channels. It’s for this reason that you remain WELL HYDRATED when you initially begin wearing the pendant. As this helps to not only move through the detox more efficiently but also allows for negative ions to be more efficient in the body. If you have access to a sauna we suggest using it daily while initially using the pendant. Otherwise hot epsom salt baths can be very helpful for this process. Is the Pendant for You? Do you surround yourself with computers, cell phones and other EMF radiation sources all day? Do you find your energy is always low and nothing seems to help? Do you wish to expand and enhance your meditation and energy work? A question we treat very seriously the answer though is… Absolutely! I can say this without any concern as I’ve done A LOT of research not only on the pendants themselves but the entire concept from which they work. I NEEDED to be certain that these pendants could only help. With all the mis-information out there I wanted to put some clarity to the issue. The pendant is made from 100% natural materials, all of which have been tested, checked and certified to contain compounds that emit energy well within safe limits for human exposure. I have a certificate from the manufacturer as well which ensures this. There is much to go into on this topic however as natural deep earth minerals ALL emit some form of earth based radiation (which isn’t just safe but healthy! – please email me if you have any questions about this). If the pendant ever chips or breaks into pieces will it stop working? Nope, you would just have separate pieces emitting the ions and a less visually appealing pendant. The best way to see it is as a 100% while whole. If about 10% chips off then the overall energy decreases by 10%. However that other 10% that chipped off will still emit its full 10% of the overall energy. So you can carry the extra piece and still receive equal benefits as if it was all together. Ideally of course one would want the pendant to be in one piece, of course I’ve had customers who have had it break in half and continue to carry one piece in each pocket and continue receiving the benefits. We Guarantee if your pendant breaks or chips for ANY reason within 1 year of purchase we will ship out a replacement, all we ask is that you pay the shipping. Money Back Guarantee – Not Satisfied with the Pendant? No Problem! Send it back within 365 days to receive a full refund (minus additional shipping fees or return shipping fees). 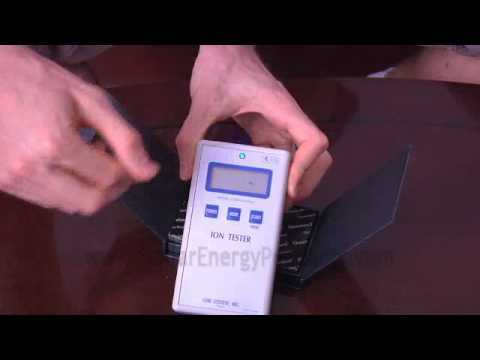 As we show on our site, we test all our pendants as proof of energy emission. However we are not a Fusion Excel Dealer nor do we sell Fusion Excel Pendants. If your concern is with the brand and not in EFFECTIVENESS then I suggest you purchase elsewhere as our ONLY concern is effectiveness. Which is why we spend our time testing and using our products as opposed to spending our time slandering the competition as most other online vendors seem interested in doing. The ENTIRE Fake vs Real concept was a marketing tactic that the Fusion Excel MLM company created to confuse and corner the consumer market to create buyer fear and ensure they end up buying from them over any other competition such as ourselves and other companies, Bioexcel, Biowill etc. The irony is this “Fake” vs “Real” argument has ABSOLUTELY NO relevance to Pendant effectiveness. It’s ENTIRELY based on superficial product/packaging judgements and NOT based on the energy and quality of energy being emitted. In our tests Fusion Excel Pendants among many others consistently test at the 1600 negative ion emission. Put in perspective, the FREE BONUS card we give you emits about 1500-1650 negative ions per cubic centimeter. I Read Online bad things about you, your pendants etc, etc. You can read nonsense all over the web from other companies trying to compete with us (This is VERY common) OR from people who are completely closed minded to the concept of the pendants (And are often closed off to Natural Healing/Alternative Medicine in General). 99% of these same people have never even worn a Scalar Pendant! These individuals feel the need to bash or argue against ANYTHING that goes outside their limited view of reality. The truth is that the slander will ALWAYS come from one of two sources. “Competition” OR an individual with an axe to grind against any progressive alternative or holistic therapies in general! It’s for this reason I emphasize not listening to any of the nonsense and trying one for yourself! You will always be the best judge of what you feel is helping. This is a long discussion I could provide pages upon pages of info on if you wish. However in a nutshell, we’ve done our research. I’ve given our strongest pendants to an expert on REAL WORLD effects of deep earth radiation. In his own words and I quote “Our strongest pendant would need to have an energy concentration 26x higher in mRems (which is A LOT!) in order to begin to become more harmful than beneficial. In fact he suggested we could easily increase the energy of our pendants to improve them with ZERO negative impact! You will hear MANY things from people all over the web or those who THINK they know what they’re talking about in terms of natural deep earth radiation. I can assure you we’ve put in our time and energy to be 110% assured that not only are our pendants SAFE, but ALSO VERY EFFECTIVE! We sell working pendants which we test ourselves and can verify the energy of. As well ALL our testimonials are unique to us and OUR pendants. If you want to know what you’re getting from us you don’t have to go any further than to see our energy emission videos and to read our testimonials. We USE our own products! There are many people out there selling similar pendants or other energy products and the irony is that they don’t even use them! We sell Icelandic Volcanic Rock Pendants which emit deep earth energy. We've been selling them since 2010 and have sold thousands in this time with a great deal of positive feedback! Copyright 2018 Scalar Energy Pendants | All Rights Reserved.